This is a guest post by Martin Sewell, a retired Child Protection Lawyer who takes a special interest in Safeguarding as a member of General Synod. When I was elected to General Synod, I had not intended to become so engaged with the problems of historic child abuse within the Church of England. Having spent much of the latter part of my professional life working in this tragic and stressful area of legal work, I was looking forward to a fresh start supporting calls for the development of Digital Evangelism. Ironically, it was internet communication which led me back to where I did not want to go. It was this Archbishop Cranmer blog which first introduced me to the case of the late Bishop George Bell, and upon reading a little of our institutional handling of the case, I soon found the alarm bells ringing inside my head like on the bridge of the Titanic. I could see that things were being handled ineptly and added my voice to the call for the review, even though I knew little of the Bishop and had no personal attachment to his memory. I simply wanted my church to enact and exemplify sound legal practice and fair process. I saw that the watchwords for reform needed to be ‘Transparency and Accountability’, and inevitably an end to deference. Lord Carlile’s report has recently been lodged and we shall soon know what the answers are. I personally made detailed submissions to his review as an outside commentator with no access to the internal material, and have taken the precaution of sending a copy of those submissions to a number of people, including His Grace, so that when the report is published I cannot be accused of criticising with hindsight if the review says what I expect it to conclude. Given that history, and my willingness to contextualise the failings of Lord Carey in the case of Bishop Peter Ball, you might not have expected me to be very popular with the victim community when I decided to stand with them on Friday as they protested at the Meeting of Anglican Primates at Canterbury. The survivors and their supporters have recognised that those of us who are advocating for good practice serve not only the interests of the institution, but of accuser and accused alike. I feel grateful and privileged that victims have trusted me, shared their stories, their views and a few confidences, so that I may continue in my purpose to help the church put right what it has manifestly been getting wrong for years. Listening to the victims is an essential part of this. You do not have to spend much time talking with abuse victims to learn how much they suffer chronically at the church’s hands, long after their abuser has been identified. Much abuse is about the misuse of power, and part of its destructive nature happens in later life: victims can continue to feel vulnerable, marginalised, suspicious, undermined, and, in the worst cases, even blame themselves for their own victimhood. Imagine, therefore, the recurring erosive effect upon victims, when their sense of self-worth is again undermined by an organisation that has routinely inflicted chronic delay, an arbitrary application of time limits, promises made but not delivered, an unclear process, and sometimes outright disrespect. In the days leading up to the Canterbury demonstration I spoke with one of the church’s leading critics, who unfortunately could not attend. ‘Gilo’ wants a change to our entire church culture. I liked his observation that it is not helpful to lump all these issues together under the term ‘Safeguarding’: safeguarding, he points out, is preventative. It is the historic cases of the demonstrators which present the greatest challenge. These are the people who were not safeguarded. Gilo identifies the need to focus separately, sensitively, and individually on the needs of the victims. He speaks of the need for us to develop policies and a culture that “transforms surviving into thriving”. We must not lose that idea. Quoting one of the few members of the church hierarchy he trusts, he told me that too often the settlement of a claim and the payment of damages is seen as “the closing of the curtain, whereas it should be seen as the raising of the curtain.” Plainly, we in the Church of England need to envision what that might look like in practice. In his interview for BBC News, Chris Hernandez, a survivor of Peter Ball, very scrupulously explained that their complaint was not about current measures to protect today’s children which he acknowledged have improved, but rather the care and response to the historic victims where the problem is centred. It is a fair and worrying question that remains unanswered. At present he is having to press matters through a CDM (Clergy Discipline Measure) process that is not well-suited to this purpose. He also discovered an internal church memo in which he was described as ‘slippery’, and which warned that he “has engaged a clever lawyer”. Leaving aside the bizarre implication that the Church of England would feel happier had he had engaged a stupid lawyer – and the question why we don’t have this lawyer on the church payroll – what does this tell us about our current institutional attitudes? Yet generosity of spirit is important. We have all made stupid remarks which we regret; I have no interest in scapegoating for it is not fundamental malevolence that worries me here – it is fundamental incompetence. People who have suffered deep horrific trauma and are required to revisit it over several years in their quest for justice might well exhibit anger, frustration, inconsistent recollection, even petulance. And do you know what that tells us? It tells us that they are normal people who have undergone the most deep and horrific trauma. Victims present in many ways, some cool and forensic, others emotional and passionate. What do real professionals do with such varied presentations? They deal with it. Apparently we don’t. Sometimes an allegation cannot be substantiated: even that can be explained carefully and respectfully to a disappointed complainant if one knows what one is doing. Respect, honesty and professionalism go a long way in this field. Complainants are never the problem. But when we let them down, when we fail to explain and communicate, we are the problem. Our National Safeguarding establishment may claim to have a culture of believing the victims, and in dealing with the long dead Bishop George Bell they very plainly did. But victims with complaints against the living complain that they do not even enjoy the lower, and perhaps more achievable performance standard of being taken seriously. They also observe that the higher up the food chain your complaint might be directed, the less chance you will have of being believed. The Iwerne Trust survivors consider themselves especially aggrieved because they ask questions of the Archbishop of Canterbury which remain unanswered. The Rev’d Graham Sawyer was one of Bishop Peter Ball’s victims. I was astonished to learn from his experience that there is currently no formal complaints procedure in place if a victim feels ill-served by our National Safeguarding Team or Safeguarding Officers. It is being constructed as I write. This is 2017. Think of all our years of scandals and our habituation to hearing victims telling their stories of inactivity in the face of serious allegation, letters routinely unanswered for weeks, and phone calls repeatedly un-returned – and we are only just getting round to establishing a complaints procedure for victims to raise concerns about unresponsive staff. I heard of a ‘gallows humour’ competition among survivors to see who had written the most letters to the church on an issue without an answer. My informant claimed 17 but was not confident this would be a winning score. A Legal Aid solicitor’s practice with such standards of client care would be shut down within a week. That is very discomforting to read. It is very discomforting to report. As may be seen, survivors are not a monolithic group: their coalescing at that demonstration represents not the culmination of the Church of England’s problems in this area, but only the start. Having previously worked independently with occasional indirect communication between them, they are now linking up to campaign closer together. I learned of other scandals which will be coming into the public sphere this autumn, intensifying public scrutiny. On the day, the church did engage with them, and the Bishop of Lambeth, the Rt Rev’d Timothy Thornton, came out to talk with demonstrators and press. He listened respectfully, answered questions, and only returned to the Cathedral Close when the discussions had run their natural course. He agreed to joining some in a requested ‘selfie’. The selfie was no triviality. Iwerne Survivor Andy Morse was visibly moved by the gesture, and explained that the families of victims suffer greatly, supporting their hurt loved ones, so the photograph with a bishop taking them seriously was significant and encouraging for those who offer great service in support but who could not be present. Bishop Timothy invited three survivors who wanted to discuss matters in greater detail to join him in a private discussion within the Cathedral Precincts, which they did. During that part of the meeting, which was witnessed by the press, the Bishop spoke of progress made, work in progress, and serious intent. He is not wrong to do so. The church has engaged fully, and invested considerable resources in its co-operation with the Independent Inquiry into Child Sexual Abuse, which is being conducted by Professor Alexis Jay. A year ago Archbishop Justin appointed a new bishop with Safeguarding responsibility, and Bishop Peter Hancock has, in his first year, largely carried the confidence of the church’s critics. Inevitably, any major reform will need to await the outcome of the Carlile review. Critics insisted that a high calibre, legally qualified Chair was required, and the church duly appointed one. The Bishop of Crediton, the Rt Rev’d Sarah Mullally, has been designated to receive a review of one of the major cases. The progress report is potentially a good news story worth reading. There is accordingly some evidence of “listening to the victim and taking what the victim says seriously”. One has to acknowledge that when major change is required, some delay is purposeful. Whenever the Church of England engages with disabled or BAME critics, it is accepting the principle ‘Nothing about us without us’. The victims of abuse who were demonstrating in Canterbury, however, have not yet felt respected or closely engaged, still less nurtured towards thriving. Bishop Tim’s outreach was appreciated, but the victims will need more than kind words before believing that that their important testimony is being fully taken to heart. It will take a degree of institutional bravery to further embrace those who still have the capacity to hurt the church. Plainly, the more the Archbishop of Canterbury supports and is seen to act upon the recommendations of Lord Carlile, Bishop Sarah and the NST, and those of Prof. Alexis Jay, the more he will disarm those calling for his resignation. Gilo proved more optimistic than I had expected. While critical of advisors, and likening the traditional culture of those surrounding the Archbishop to that of Omertà, he compared the role of the Archbishop to that of a chessboard king – to be protected at all costs, yet highly constrained by a lack of mobility. The chess-piece King is a useful image: few people in public or private life appreciate how little power is reposed in an archbishop. He is no autocrat; he presides more than he rules. In many ways he has responsibility, but no power beyond that of influence and moral leadership. The mechanisms for structural change in the Established Church are not agile. He may be criticised for his caution to speak and lead, yet if you are surrounded by a minefield with unreliable advisors and no map, one can understand a certain hesitancy. Some victims plainly blame the Archbishop because the cultural change is demonstrably incomplete, yet our Archbishop is no fool: he must know that he must either accelerate the change or carry the can. Paradoxically, the victims and their supporters could become Archbishop Justin’s best asset in the reform process, but he needs to listen and discern carefully who offers him the best way forward. These victims are a willing resource, not an irrelevance or nuisance. 1. All complaints from parishes and dioceses are to be passed to the independent body. 2. The body will gather information from complainants. 3. It will investigate the complaint using the balance of probabilities as the standard of proof. 4. It will liaise with and assist civil authorities such as the police and social services. It would ensure the police and other statutory organisations are taking appropriate action within reasonable timescales. 5. It will have the power to obtain documents from the diocese or church organisation involved. 6. It will recommend action to be taken against individuals who have either perpetrated abuse or have been complicit in covering up abuse (i.e. it will recommend whether the church should impose sanction). 7. The body will decide on reparations and support to be offered to the complainant. 8. Complainants will be allowed to take advice from lawyers and a contribution towards legal costs will be awarded. 9. The cost of the body’s work, support, reparations and legal costs are to be paid from the institutions or dioceses. 10. It will provide to Government and the United Nations Committee on the Rights of the Child regular reports on progress of church organisations in fulfilling their obligations at the UN conventions. This is a big agenda. 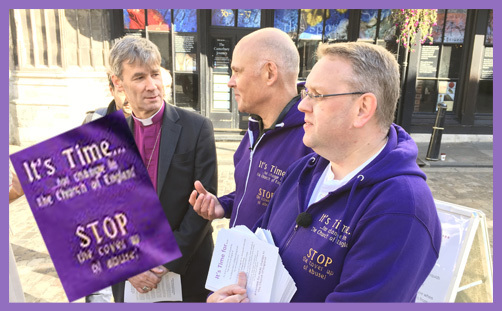 If Archbishop Justin chooses a bold initiative to transform the Church of England, and also the experience of victims, he will need General Synod to give him assent, encouragement and sustained support. But we should not underestimate the task or the opposition from the organisationally conservative who may see such reform as undermining the historic role of the 42 Diocesan Bishops. I had suggested something like David Greenwood’s model informally at General Synod earlier this year, commending the examples of the independent General Medical Council and the Solicitors Regulation Authority, but was told by a senior church figure that I was too late, that this had been previously looked at and rejected. If you want to see the outcome of that attitude you need only talk to the victims who gathered at Canterbury. Safeguarding and the care of victims have become the graveyard of episcopal reputations. In the boxing fraternity, battered contestants are withdrawn from the ring to save them from unnecessary punishment. Personally, I cannot help but conclude that General Synod needs to be similarly kind to our Archbishops and Bishops, indeed I cannot imagine why anyone in the House of Bishops would want to continue to hold responsibility within such an organisation for matters in which most have such little experience, training and perhaps aptitude. There is no shame in recognising our limitations. There is a collateral advantage to grasping the nettle of radical reform. Whether I talk of these things to traditional Catholics and Evangelicals, or to Christians of a more liberal worldview, I experience a common desire to solve the problems. What a luxury it would be to have a General Synod session devoted to an important and time-consuming issue without any doctrinal disagreement dividing us. Meanwhile, the victims of historic abuse continue to experience reform at a glacial rate: their letters go unanswered, their phone calls are refused, and whenever that happens the church inadvertently echoes the whispers of their abusers telling them nobody cares what they think. The Cathedral Close was closed for a private service. It was a rather grand occasion: mayors and mayoresses in chains, medals, fascinators, even a uniformed gentleman in tights. The problem victims face when engaging people with such a difficult issue was illustrated by the following exchange which came as a leaflet was offered to a Cathedral attendee. The private occasion was a ‘Service for Justice’.